I am humbled by the comments of my colleagues, friends, and associates on Empathy in the Context of Philosophy. That much used and routinely abused word, empathy, has enjoyed an uncomfortable popularity in fields as disparate as politics and psychoanalysis. At last a philosopher has arrived to bring clarity to the confusion. Lou Agosta has brought together the salient points about empathy as seen in neurology, psychoanalysis and literature into a happy home under Heidegger. Heidegger calls for ‘a special hermeneutic of empathy’ but does not give one. Agosta delivers it. The book is a must-read for anyone who chooses to use the word again. 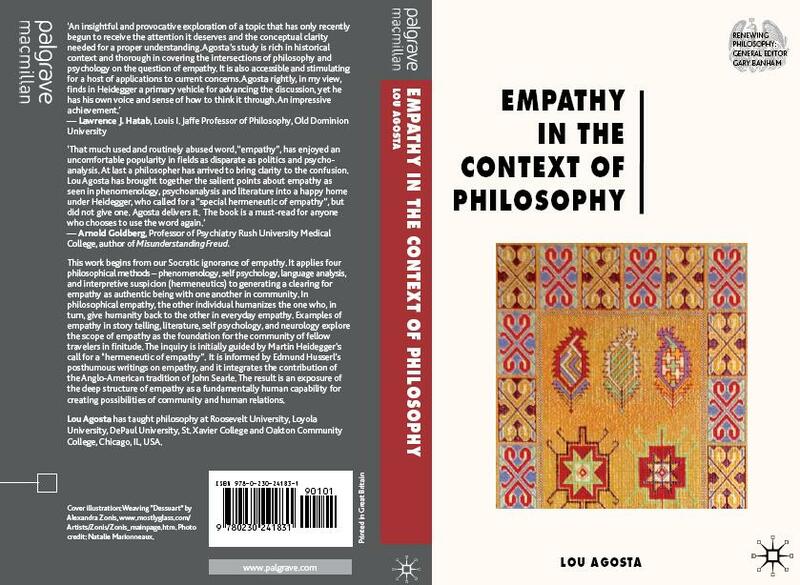 Lou Agosta’s Empathy in the Context of Philosophy is a vivid, sweeping, thought-provoking and attitude changing treatment of one of the central, if often neglected, ideas of our culture, namely Empathy. It collects and scrutinizes ideas from a remarkable array of sources — from neuroscience to hermeneutics, from analytic philosophy to Freudian psychoanalysis, from Grimm Brothers stories to speech acts — all the while demonstrating Empathy’s seminal role in our understanding of mind, ethics, and ourselves. If morality stands apart from empathy, Dr. Agosta also shows how it is a pre-condition of it. He does this, and quite a bit more, through a lively tour of much of Twentieth Century thought, all the way correcting some of that thought’s myopia and self-righteousness, and allows us to regain a fine understanding, perhaps lost in the travails of modern life, of what it is that both makes us human and provides the possibility of joy with others. Empathy in the Context of Philosophy is a masterpiece of philosophical-historical scholarship, presenting a rich and comprehensive account of the explicit and implicit conceptions of empathy that have appeared in the course of Western thinking from Hume through contemporary phenomenologists, both philosophical and psychoanalytic. Agosta’s Heideggerian interpretation of empathy is truly a tour de force. In Being and Time Heidegger criticized traditional Cartesian conceptions of empathy and called for a “special hermeneutic of empathy,” presumably grounded in his analysis of existence, but he failed to offer such a hermeneutic himself. It is this missing hermeneutic of empathy that Agosta supplies, masterfully applying Heidegger’s modes of Dasein’s disclosedness to elucidate the design structure of empathic engagement, which Agosta rightfully claims constitutes the foundation of authentic relationality. This book will be an invaluable resource not only for scholars in philosophy and the human sciences, but for practitioners of psychoanalytic and humanistic psychotherapy as well.